RONAN — A team that has athletes across the spectrum and that can score points is a team that has potential, according to Ronan track and field coach Jim Benn. The Maidens and Chiefs were District Champs last season and are looking to hold that title again this year. Benn is hoping that the hard work put in at the beginning of the season will pay off. 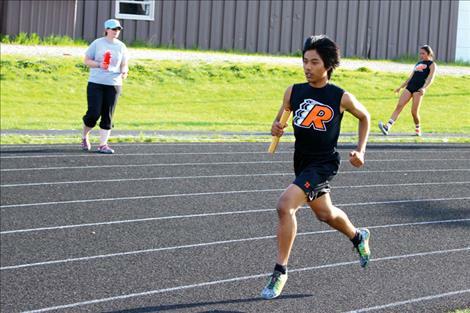 On Thursday Ronan took the track against Hot Springs and Noxon. The meet was not typical. Only doing relays, athletes mixed it up with some competing in unfamiliar events. Relays included a co-ed distance medley, a co-ed shuttle hurdle, and throwers-only 4x100 relay. Junior Ally Buhr was excited about this unconventional meet. Buhr competed in the 4x200 and 4x100 relays, placing first in both. She is also a pole-vaulter and is hoping for a season of personal bests. 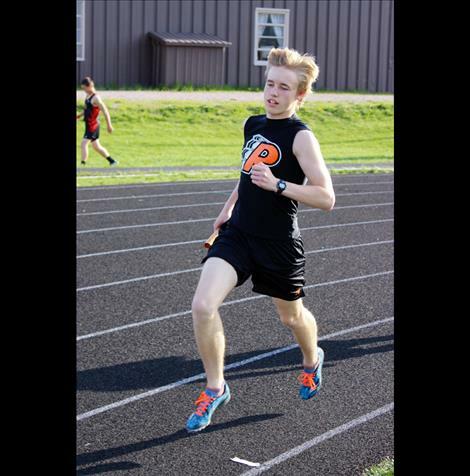 Ronan Chief Kiry Detwiler runs the 1-mile and 2-mile and has been pushing himself in practices to reach his goal. Although a team of athletes, Benn is happy to just have a group of good kids. 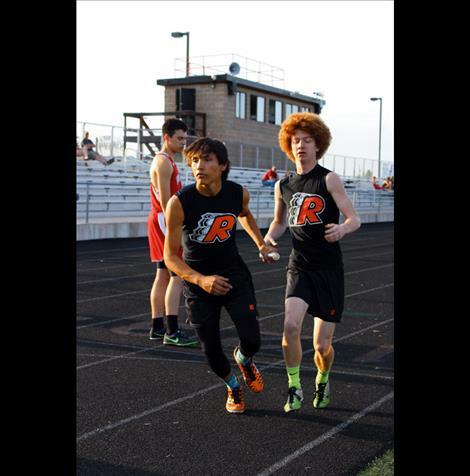 The Ronan track and field team will compete in the Glacier Triangular meet on Thursday, April 28 at 3 p.m.
4x200 Boys - 1, Ronan, 1:39.0. 2, Hot Springs, 1:44.40. 4x200 Girls - 1, Ronan, 2:03.64. 2, Noxon, 2:22.00. DMR Boys – 1, Ronan, 12:00.37. 2, Noxon, 12:50.44. 3, Hot Springs, 12:50.44. DMR Girls – 1, Ronan, 15:55. 2, Noxon, 16:11. Co-ed Spring Medley – 1, Hot Springs, 2:05.71. 2, Ronan, 2:10.98. 3, Noxon, 2:14.95. 4x800 Boys – 1, Ronan, 9:41.42. 2, Noxon, 10:53.71. 4x800 Girls – 1, Noxon, 12:55.56. 4x100 Boys – 1, Hot Springs, 48.34. 2, Noxon, 48.6. 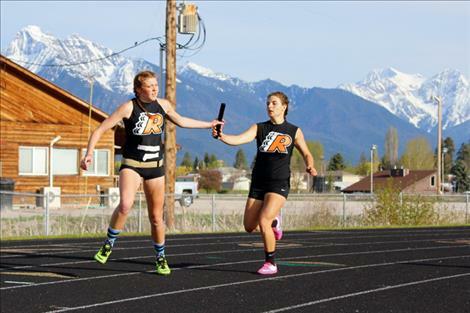 4x100 Girls – 1, Ronan, 57.51. 2, Noxon, 1:01.16. Co-ed Distance Medley – 1, Hot Springs, 10:33.71. 2, Noxon, 10:38.93. 3, Ronan, 10:45.67. Co-ed Hurdle Shuttle – 1, Ronan, 1:26.94. 2, Hot Springs, 1:29.11. 3, Noxon, 1:31.83. Sprint Medley Boys – 1, Ronan, 4:03.46. 2, Hot Springs, 4:23.13. 3, Noxon, 4:53.73. 4x400 Boys – 1, Ronan, 3:41.22. 2, Noxon, 3:56.67. 3, Hot Springs, 4:00.17. 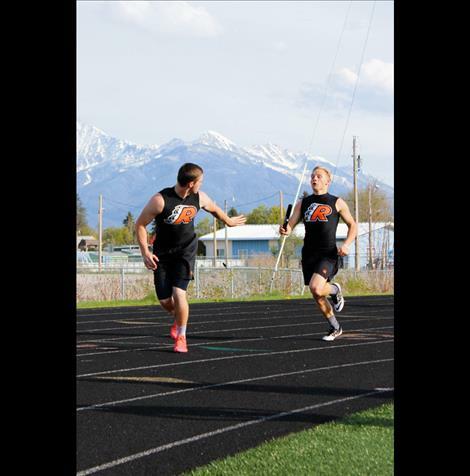 Throwers Only 4x100 Boys – 1, Ronan, 56.6. 2, Hot Springs, 57.92. 3, Noxon, 1:04.45. Long Jump (4 jumpers) – 1, Hot Springs, 60’1”. 2, Noxon, 56’1.5”. 3, Ronan, 37’4”. Shot Put (4 throwers) – 1, Noxon, 122’1”. 2, Ronan, 120’9”. 3, Hot Springs, 110’4”. Discuss (4 throwers) – 1, Hot Springs, 282’5”. 2, Ronan 231’5”. 3, Noxon, 152’6”. Triple Jump (2 jumpers) – 1, Ronan, 72’10”. 2, Hot Springs, 66’7.5”. 3, Noxon, 64’1.5”. High Jump (2 jumpers) – 1, Hot Springs, 10’1”. 2, Ronan, 4’3”. Pole Vault (2 jumpers) – 1, Ronan, 9’. Javelin – 1, Noxon, 203’11”. 2, Ronan, 185’11”. 3, Hot Springs, 172’4”.